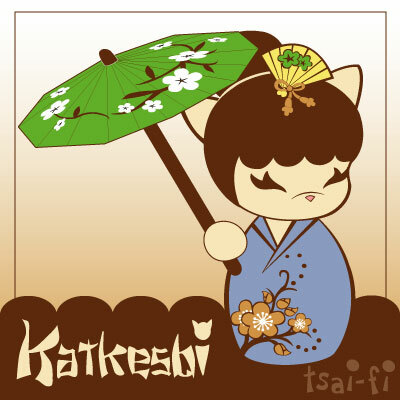 Katkeshi's are original tsai-fi characters. They were created on day when I watching a movie about a girl who appeared to be sugary sweet and innocent but was actually a true party animal. Appearances can be deceiving. I glanced over at my kokeshi doll collection and thought what if these cuties were really buckwild babes just waiting to strut their stuff. 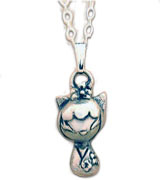 They are kitties because cats are traditionally beautifully strong willed and are full of personality. 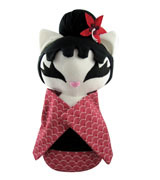 They are one half demure kokeshi and one half wild kitty. These Katkeshis love to party. 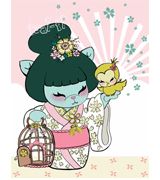 They may look quiet and conservative but they love to party are super flashy. 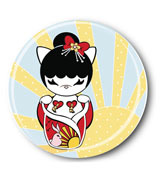 Literally, they love to flash you with sassy pasties that are hidden beneath their Kimono robes. 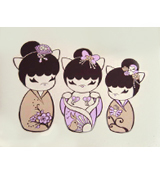 These sweet little kitties are available in figures, prints, apparel, jewelry, and other accessories.